D is advertised as a safe and fast systems programming language. “Fast code, fast." is the mantra of the D community. But how fast is it really and how suitable for systems programming? We thought to investigate this by porting a Linux kernel driver to D, documenting the process, and assessing the results. The talk will delve into the details of integrating a D kernel module with the C-written kernel, discuss the difficulties encountered, and present the performance and safety benchmarks obtained. If you ever wondered if writing a Linux driver in D would be a good idea and how to do that, then this talk could be a good starting point for you. The talk offers a starting point and proposes a methodology for those who want to port or implement a Linux driver in D and, in the end, reflects on how suitable D is for kernel programming, how fast it is in such an environment, and what improvements it brings. By the end of March, the porting of the virtio_net driver will be done. From that point on, we will begin “D-ifying” the obtained code and benchmark it. Our estimate is that by the time of the conference everything will be ready. Even if something unexpected occurs and delays the project schedule, we think that the discoveries we have made so far should be interesting enough for the D community. 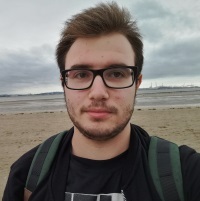 Alexandru Militaru is a student in his final year of bachelor’s studies and an undergraduate teaching assistant at University "Politehnica" of Bucharest. He is passionate about operating systems and compilers. In his bachelor thesis project, he uses the D programming language to strengthen the security of Linux kernel modules.